Tis the season for handmade gifts! Does anyone else love making simple, thoughtful gifts for family and friends. Homemade sugar scrubs and soaks are one of the easiest handmade gift ideas. One batch can yield enough for several containers making it quick and easy to put multiple gifts together all at once. The recipes being featured at this week's link party all make fantastic gifts for teachers, neighbors, friends and even sweet-smelling stocking stuffers for family. Don't forget to pamper yourself a little during this busy holiday season. Hold a few portions back of these homemade scrubs and soaks to give yourself a spa-like treatment after a hectic day. Your skin will thank you! Winter weather can be harsh on skin. 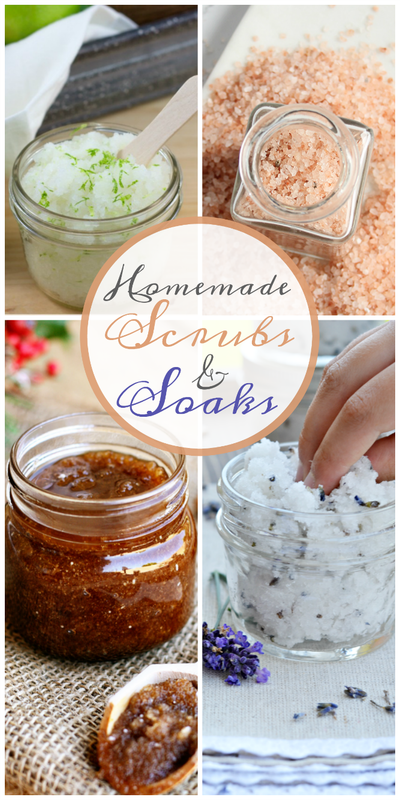 Homemade scrubs and soaks to the rescue! Theses recipes have amazing health benefits without the artificial ingredients found in similar store-bought versions. Go ahead pamper yourself and those you love this holiday season with a batch of one of these fantastic recipes! It might be cold outside, but this scrub will have you daydreaming of tropical destiantions with it's combination of coconut and lime. Click on over for the full recipe! This bath soak turns your bath at home into a spa-like retreat. And your going to love the little containers that Kristy chose to store it in! These really would make perfect stocking stuffers! Here's a scrub that's perfect for the holidays! With cinnamon, sugar, and vanilla I'm sure this one smells good enough to eat. Both your nose and your skin will thank you! Who loves the relaxing scent of lavender? This scrub is perfect for you! Go ahead! Mix up a batch. You deserve some pampering. I hope you're having a great December so far! Thanks for hosting. I just linked up my free buffalo plaid printable & recycled pen holder. Off to check out the other link ups.